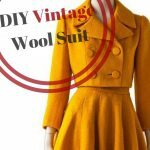 Hello, my dear sewing soulmates! I have a very simple tutorial for DIY Easy Box Pleated Skirt to present to you! I couldn’t be more in love with this project. It has everything that I love – it’s simple, it’s quick to make and it’s very easy to customize by playing around with different fabrics (AND IT’S PINK!!!). Lay out your material. Decide how long do you want your skirt to be, add 3 cm to that number and start marking that point on your material. 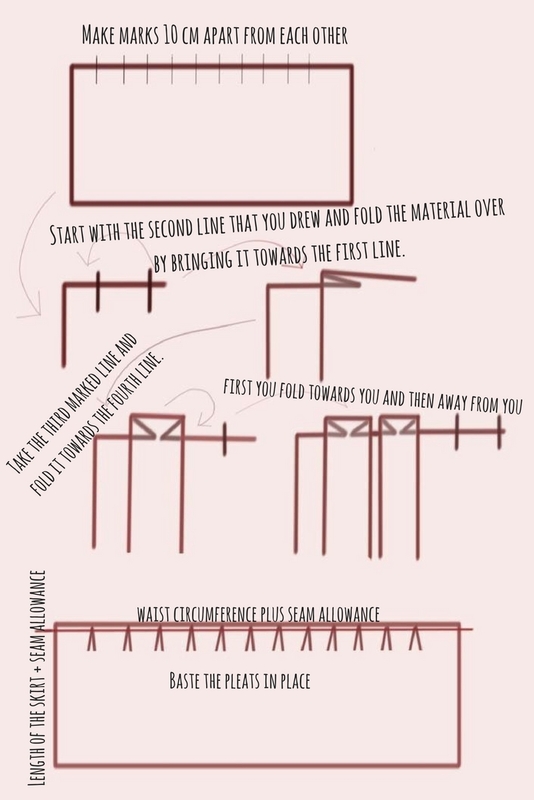 Draw a long line across the length of your fabric. Next, starting 6,5 cm (5 cm + 1,5 cm for seam, allowance) away from the edge of your fabric make a mark for the first pleat. Keep making marks 10 cm apart from each other across the upper edge of your fabric. Start with the second line that you drew and fold the material over by bringing it towards the first line. Pin it in place, making sure that everything is flat. Take the third marked line and fold it towards the fourth line. Pin it in place. This way you’ve made the first complete pleat. Take next line and bring it to meet your previous pleat. Move to the next line and fold the material towards the next line. To recap – first you fold towards you and then away from you. 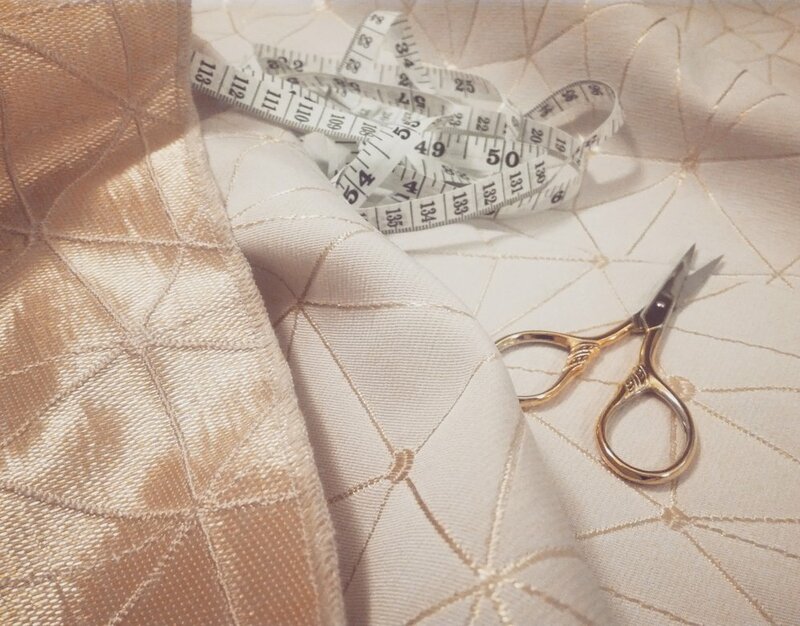 Keep going until you have your waist measurement plus 6,5 cm on the other edge (or at least 1,5 cm for seam allowance). Once you have enough pleats and everything is pinned securely, mark the end point of your skirt and connect it to the line you’ve made to mark the length of your skirt. Now, cut out your skirt along that bottom line. Make sure that every pleat is securely pinned and baste the top of your skirt. If you have that possibility, serge or zigzag the edges of your fabric now. Waistband needs to be as long as your waist circumference plus 3 cm for seam allowance. I wanted my waistband to be thin, only 2 cm wide. 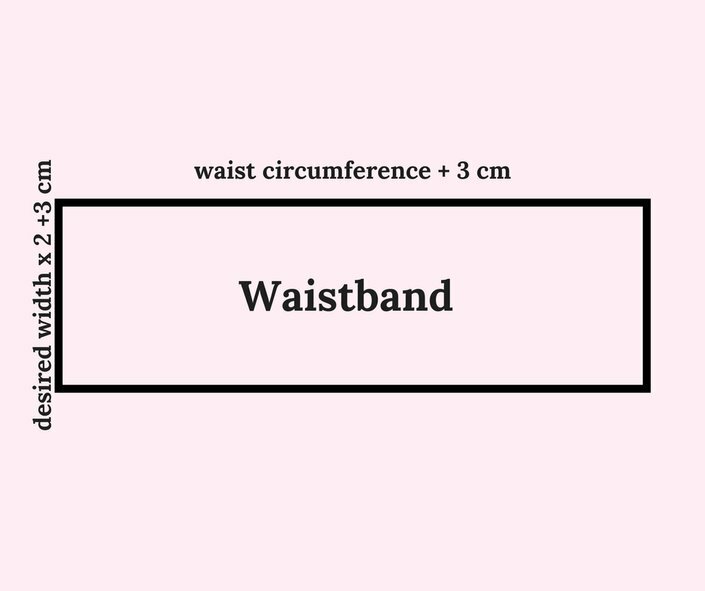 To calculate the width of your waist take the desired width of the final product, multiply by 2 (because you will fold it) and add 3 cm for seam allowance. 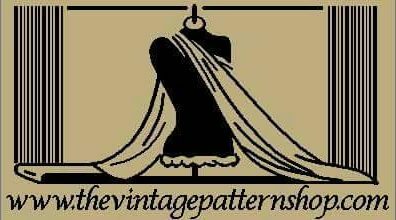 Once you have the pattern and cut it out it will be a good idea to interface your waistband piece. Fold your waistband in half (lengthwise) and iron it. Next, turn up the seam allowance (1,5 cm) on one side and iron it to press it down. Pin the waistband to the skirt, right sides together. Pin the side of the waistband which does not have the upturned seam allowance. Sew with 1,5cm seam allowance. Now grade the seam allowance under the waistband and once you’re done, iron the seams up towards the waistband. You can also give it a press on the other side, just to make sure the seam is flat. You will finish attaching your waistband after you put in the invisible zipper. Pin the side seams of the skirt right sides together and sew. Stop around 10 cm away from your waistband (this depends on the length of the zipper you have). Press the seam open. Attach the invisible zipper using this tutorial. It’s my favorite and everything is explained in a very clear way. While attaching your zipper to the side of the skirt, remember to align the top of the zipper with the middle of your waistband. This way, once you’re finished, the zipper will reach all the way to the top of the waistband. Tuck in the seam allowances on the sides of the waistband and give them a good press. Once they are stable and stay in place, fold the waistband over and start pinning it. Your DIY Easy Box Pleated Skirt is ready! Put it on and let me see what you’ve made! How do you like this DIY Easy Box Pleated Skirt? I am curious to hear from you! If you liked the tutorial, Pin it to save it for later.